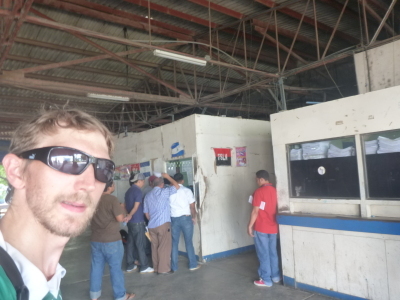 Almost everyone you meet will travel through Central America overland and we did the same. 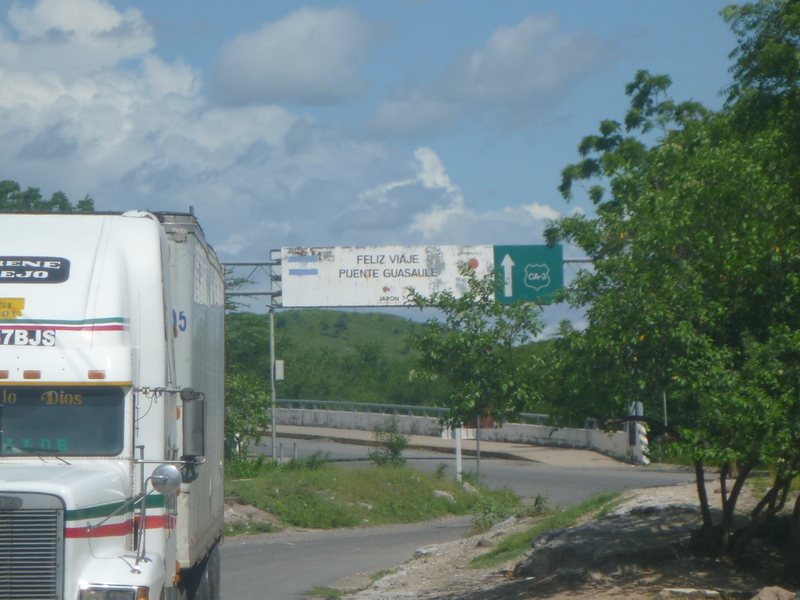 We started off in Mexico City and crossed every border overland (except for the Belize to Honduras which was by boat). 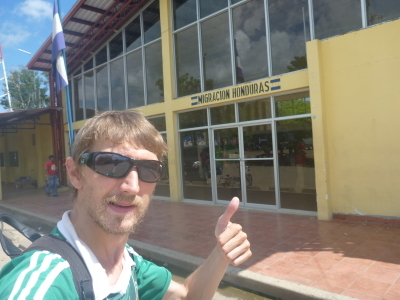 After exploring Tegucigalpa and staying in the Hotel Linda Vista, I decided to head straight for Nicaragua – I spent two full weeks in Honduras in the end including a week on Utila diving. There are a few different border crossings and options, but I decided to go from Tegucigalpa to Leon by bus, and I used the company Tica Bus – one of the most popular trans country bus companies in Central America. Tica Bus Terminal in Tegucigalpa. Apparently you can book the tickets online, and this may be essential during busy times and to make sure you get a seat. 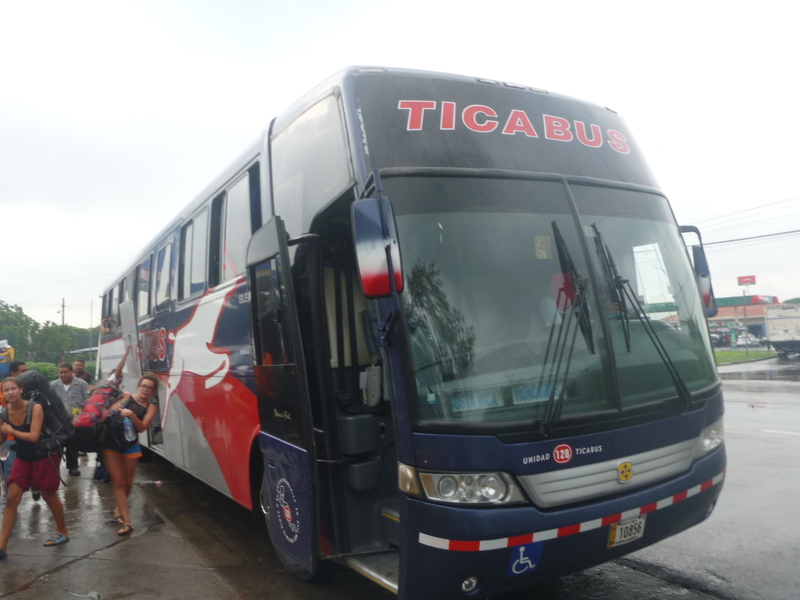 But I didn’t, I just decided to go to the Tica Bus Terminal in Tegucigalpa on the day I wanted to leave. Please be aware that the Tica Bus terminal in Tegucigalpa is nowhere near the city centre. The Tica bus terminal in Tegucigalpa. 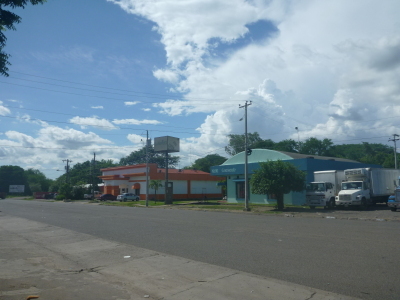 It has moved recently and a lot of the hotels and tour guidebooks (including Lonely Planet) are incorrect as they tell you it is in the southern part of Comayaguela – it’s not. 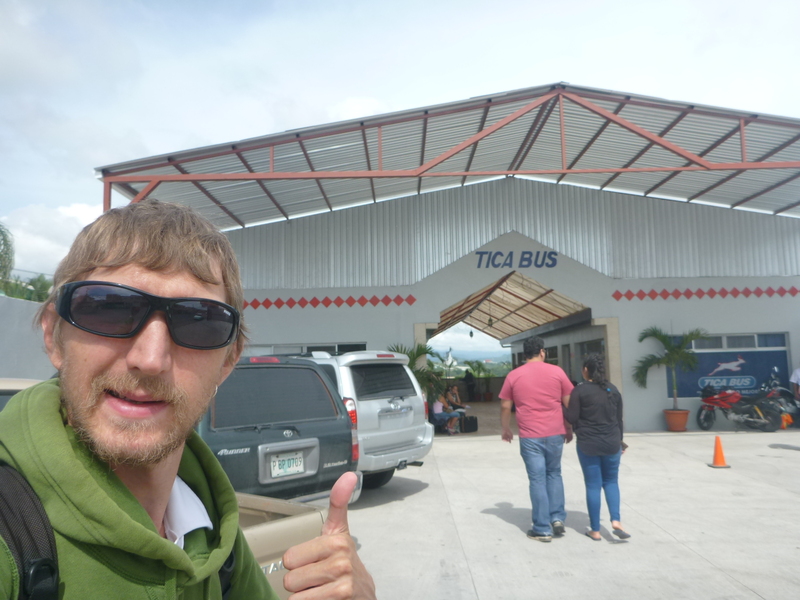 The Tica Bus terminal is now near the airport and I used a taxi to get there – around 7.30am. Leaving my hotel in Tegucigalpa – Hotel Linda Vista. 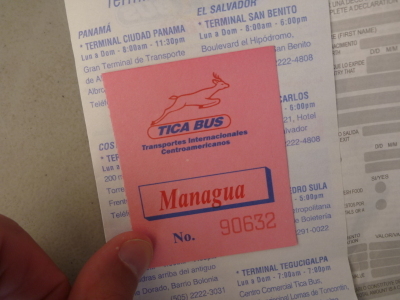 I went up to the counter in the Tica Bus terminal and ordered a one way ticket to Leon in Nicaragua. 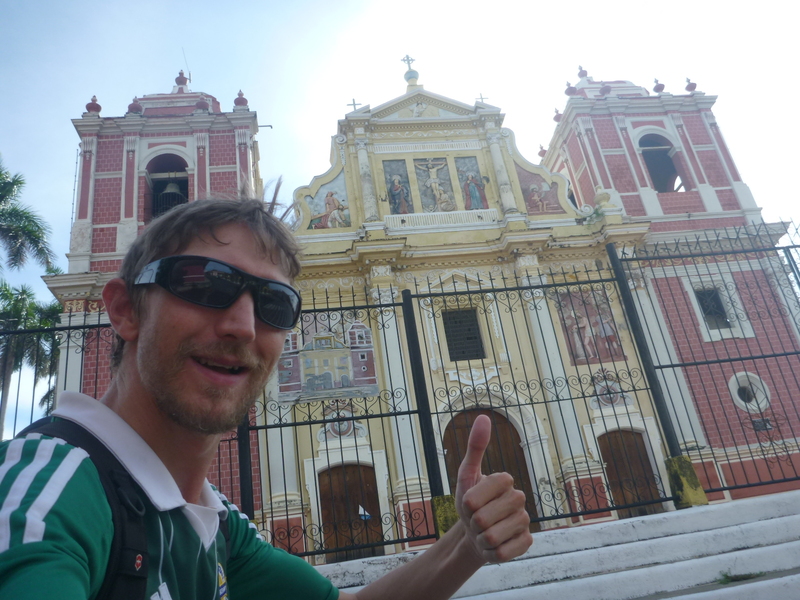 I decided to stop off in Leon first – a city famous for its churches, rather than head straight to Managua, the capital city. The only thing about this decision – it is the same price to get to Leon as it is to go all the way to Managua (an extra hour or so in the bus). 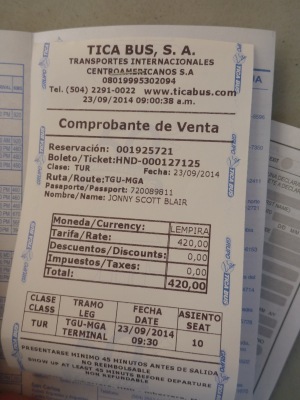 My bus ticket cost 420 Lempira (almost exactly $20 US). Payment is in cash onyl (USD also probably accepted). You’ll get issued with an exact seat number and ticket. I got my ticket at 8.15 am and the bus was due to leave at 9.30 am. 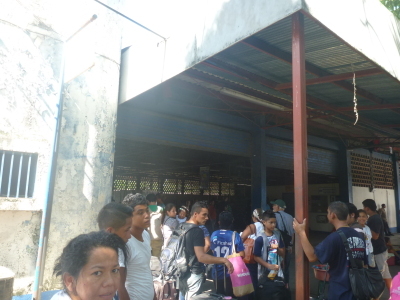 As it got closer to 9.30 am, the bus tickets sold fast and eventually that bus was full. 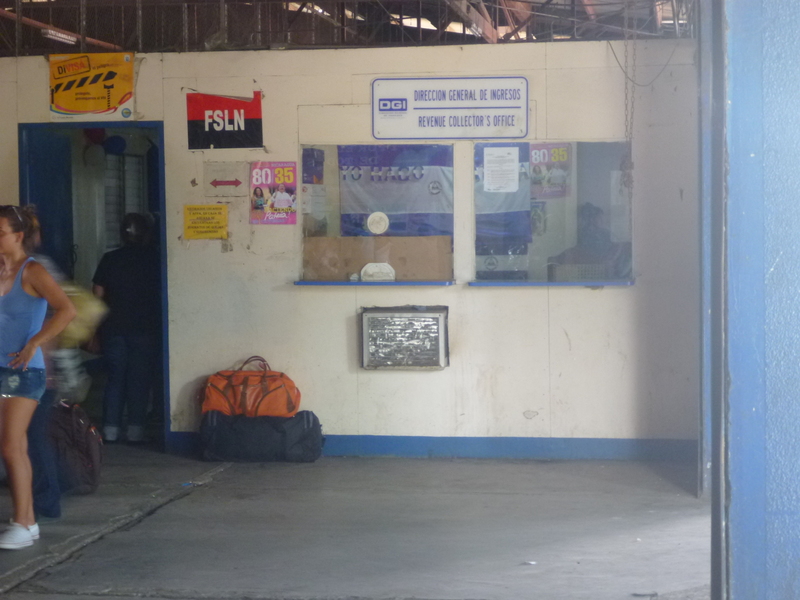 Between 8.15 and 9.30 I just stayed in the bus depot and had a coffee – I’d already had my breakfast at the hotel. You can go out into the nearby streets if you want and look for a coffee shop/cafe that is cheaper than the Tica Terminal but I had my big bags with me, my notepad out for blogging and I was happy enough. The bus arrived just after 9.30 am, with passengers already on it. 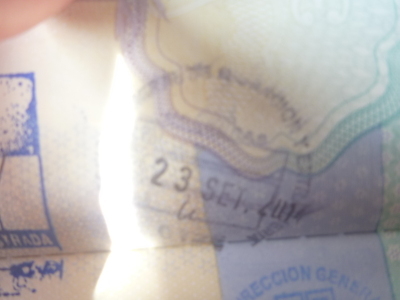 I assumed they had travelled from San Salvador or San Pedro Sula. The bus from Honduras to Nicaragua. I boarded and we left the capital city Tegucigalpa a bit later than expected, around 10.17am. 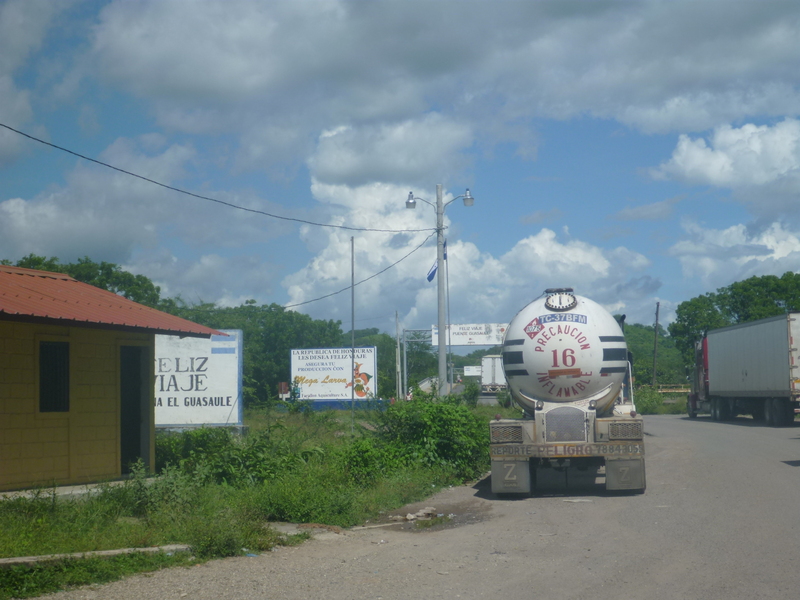 The journey down to the border was smooth and scenic. I was next to a Honduran guy on the bus and we chatted a bit before I turned on my iPod. Just before we get to El Guasaule, one of the two guys working on the bus comes and hands out immigration forms and asks for passports and money. There were about 2 or 3 other foreigners on my bus as I noticed and they had done as this guy had said, by handing over the money and their passports. For the meantime I didn’t. I always prefer to do these things myself, as you normally save money and get the real experience of doing the border crossing yourself. Local Hondurans were being charged $5 US to cover the border charges, and foreigners were being charged $15 US. (these are the charges both to leave Honduras and enter Nicaragua). 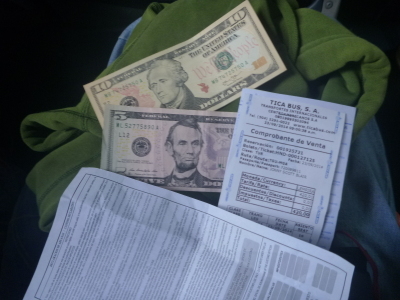 Money and documents ready to leave Honduras. When you travel in Central America, the border guards can try to rip you off, as happened when I first entered Guatemala from Mexico, and when I crossed into Honduras from Guatemala at El Florido. I have heard that if you get off the bus and try to do things yourself, you may save $3 US and get it for $12. On this occasion, I oddly opted just to pay the money and be done with it. I kind of wanted to use up my Lempiras at the border by grabbing some snacks and drinks. 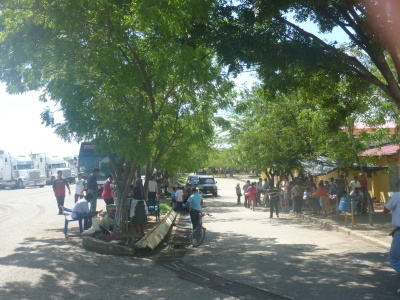 Leaving Honduras at El Guasaule. 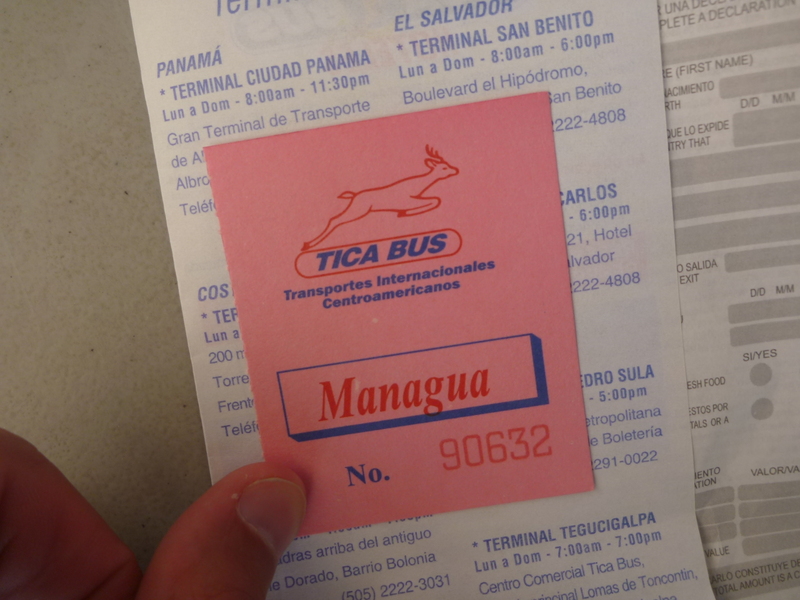 When we stop at El Guasaule, the guy on the bus takes the money and passports in one quick visit to the immigration offices to get all the stamps done. Everyone on our bus had given him their passports. So if I had chosen to do everything on my own, I probably would have saved $3 but would have had to do the queuing myself and probably hold the other passengers up. Our passports are all given an exit stamp, but not in our presence. Exit stamp for Honduras at El Guasaule. 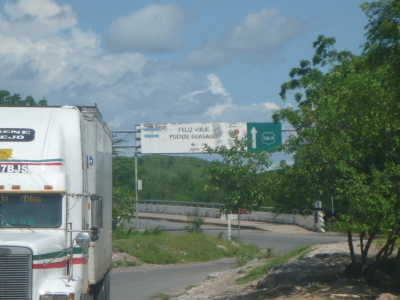 I used the time to make videos at the El Guasaule border exit point, take some photos and buy some drinks and snacks with my remaining Lempiras. I would wait until arriving in Nicaragua before getting my Cordobas. 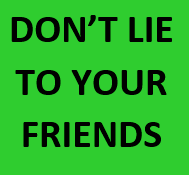 There are lots of kids and money changers hanging around the border – check their rates before changing money and be on the lookout for potential scams and thieves too. After about 20 minutes, we get back on the bus and drive across the border to the Nicaraguan arrival point, which is also called El Guasaule. 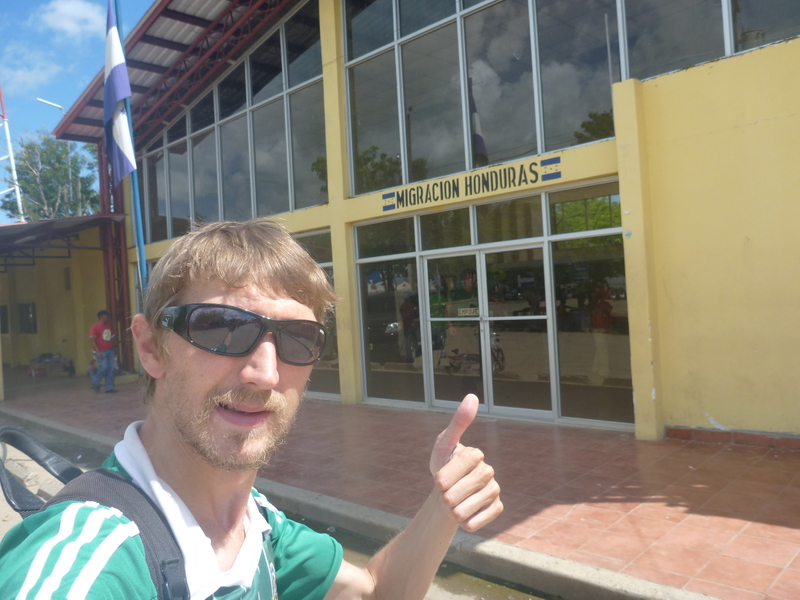 We arrive into the Nicaragua immigration point and it is much more strict. A long queue to check every bag. We have to take our bags off the bus and walk up to the queue. Bag check in Nicaragua – took about 40 minutes. 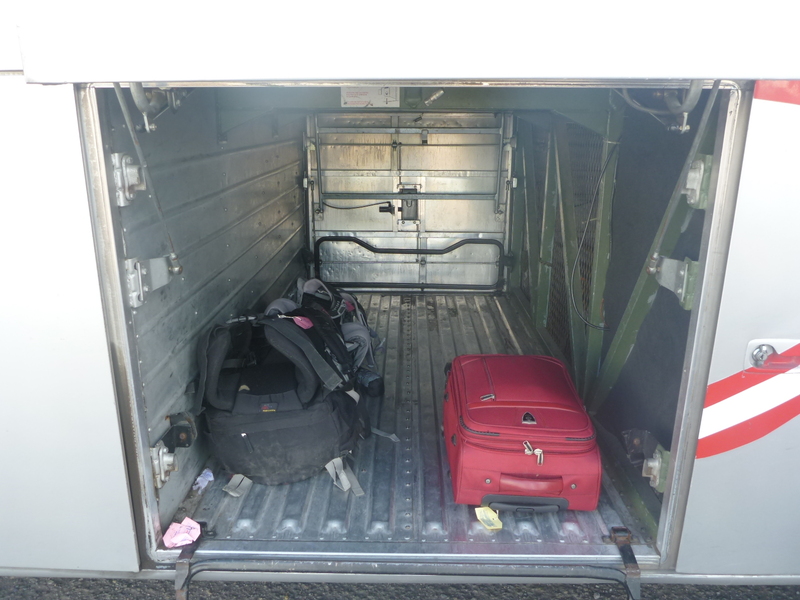 It takes around 40 minutes to get through the bag check. At the same time, our passports have been taken and checked and rather than getting an actual passport stamp for entry into Nicaragua, you get a Tourist Card. 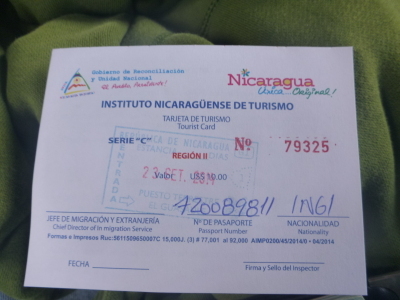 Tourist card for Nicaragua – front. 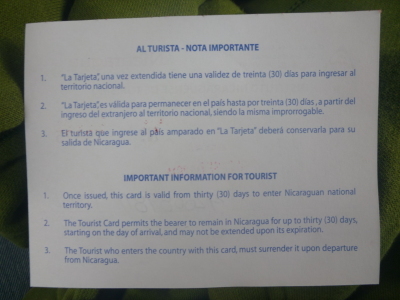 Tourist card for Nicaragua – back. This tourist card is kept for the duration of your stay in Nicaragua, and you surrender it on exit (I later left into Costa Rica). 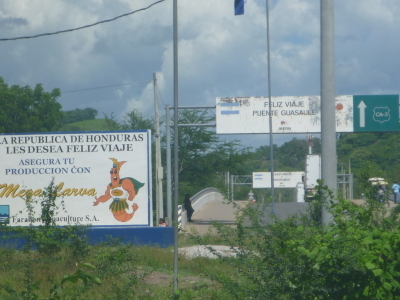 Nicaraguan side of the border. 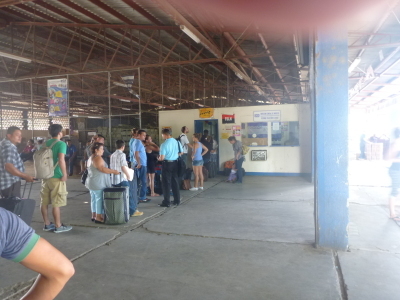 After that we load up our bags again, get our passports back and head towards Managua. We have a stop for some passengers to get off at the city of Chinandega (which I also considered doing before choosing Leon). There is torrential rain everywhere. 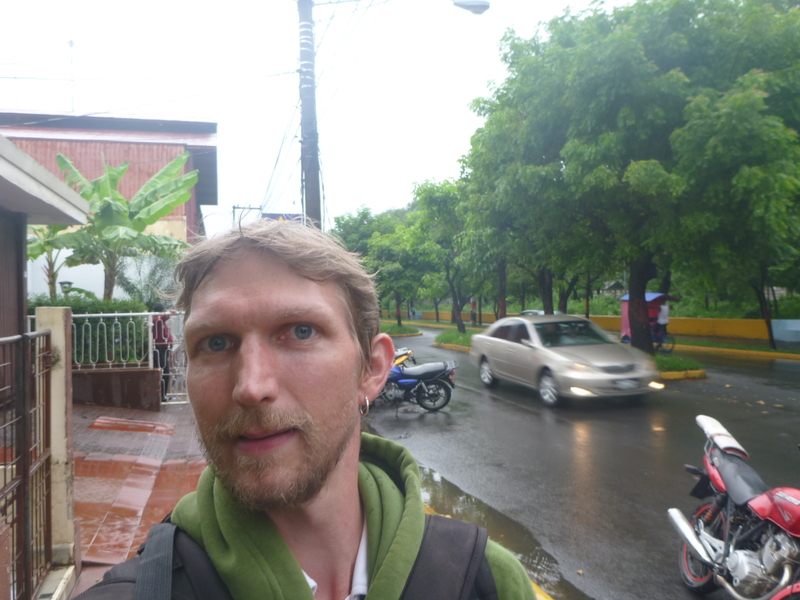 A wet arrival in Leon, Nicaragua. Around 4pm and before it got dark, we arrive in Leon. 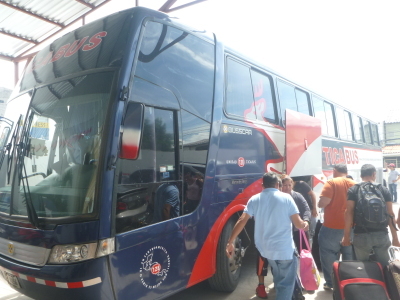 The bus drops you off at a petrol station on a highway a few kilometres from Leon. Having just arrived in the country, I was in no mood for a taxi and brushed aside offers from taxi drivers and just walked it to the city centre. I didn’t have a hotel or hostel booked, so decided to head to one of the first ones I saw. 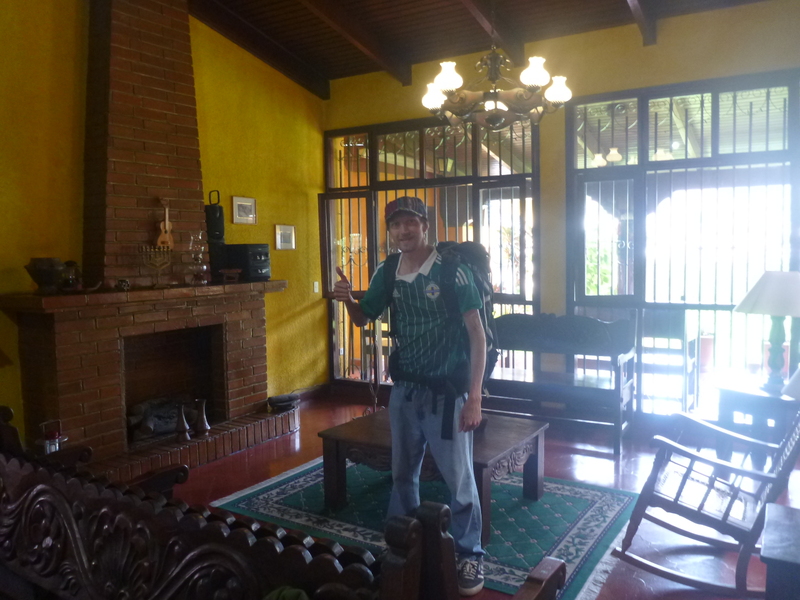 After about 30 – 40 minutes of walking in the torrential rain, I decided to stay at Casona Colonial Hostel which did the job! The journey had taken a full day (daylight wise) and I was now safely in Leon, Nicaragua. 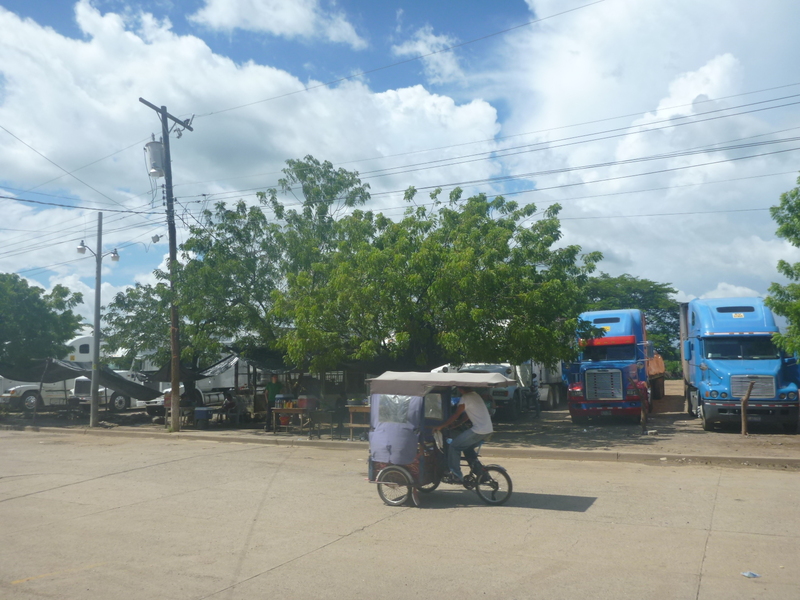 Arrival on the edge of Leon, Nicaragua. 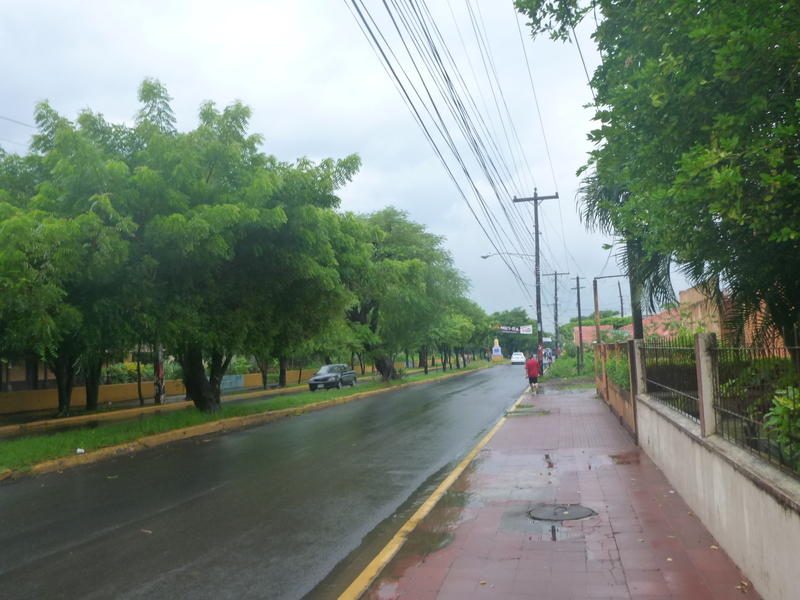 Walking through Leon to my hostel. Leon is a great city to explore home to some cool churches with volcanoes and beaches nearby. This entry was posted in El Guasaule, Guasaule, Honduras, Leon, Managua, Nicaragua, North America, Tegucigalpa, World Borders. Bookmark the permalink. 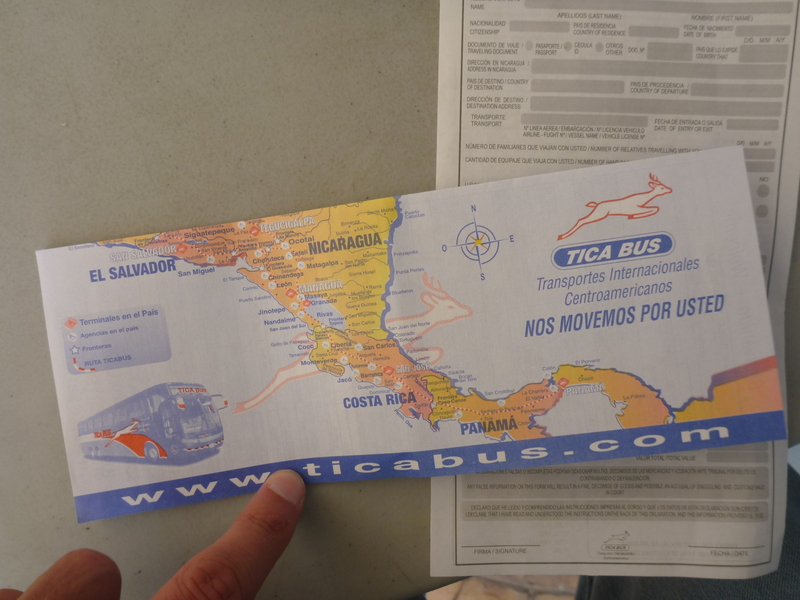 Congratulations for this website; it is really encouraging me and inspiring my plans to travel all over Central America by bus. 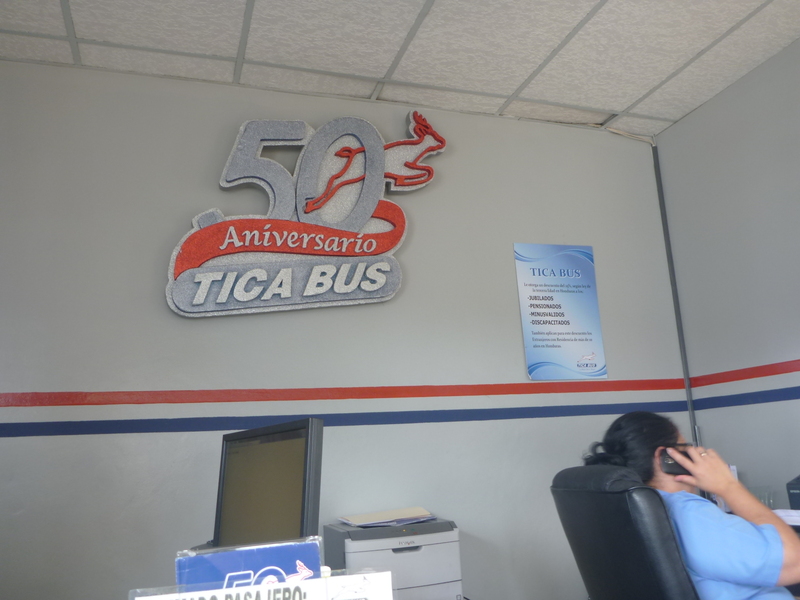 I looked on line and can’t find the stop on the tica bus for león on the route. Can you tell me if it’s a stop or ? 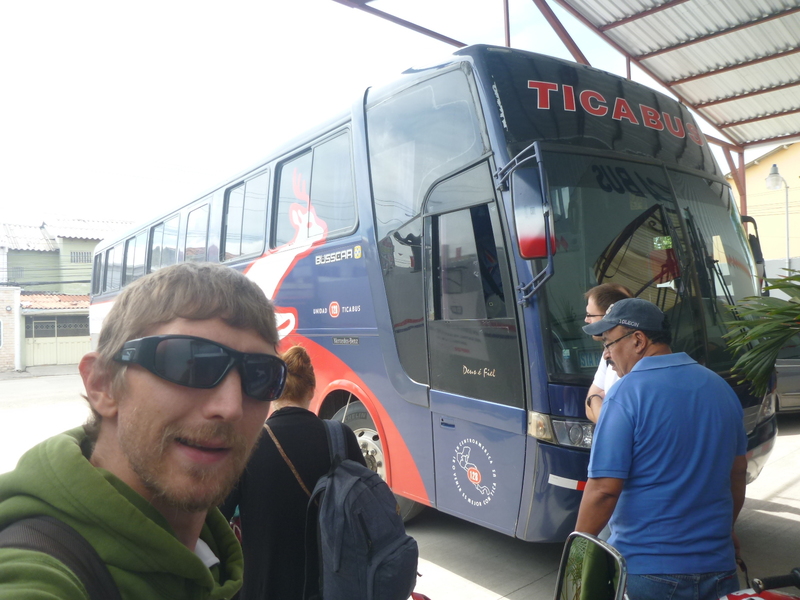 Just a short note to say thanks for this post – I was looking for info on getting from Tegucigalpa to Leon by Ticabus in a couple of days. 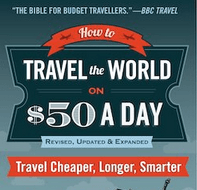 I wasn’t expecting to find something so thorough – or so thoroughly useful! 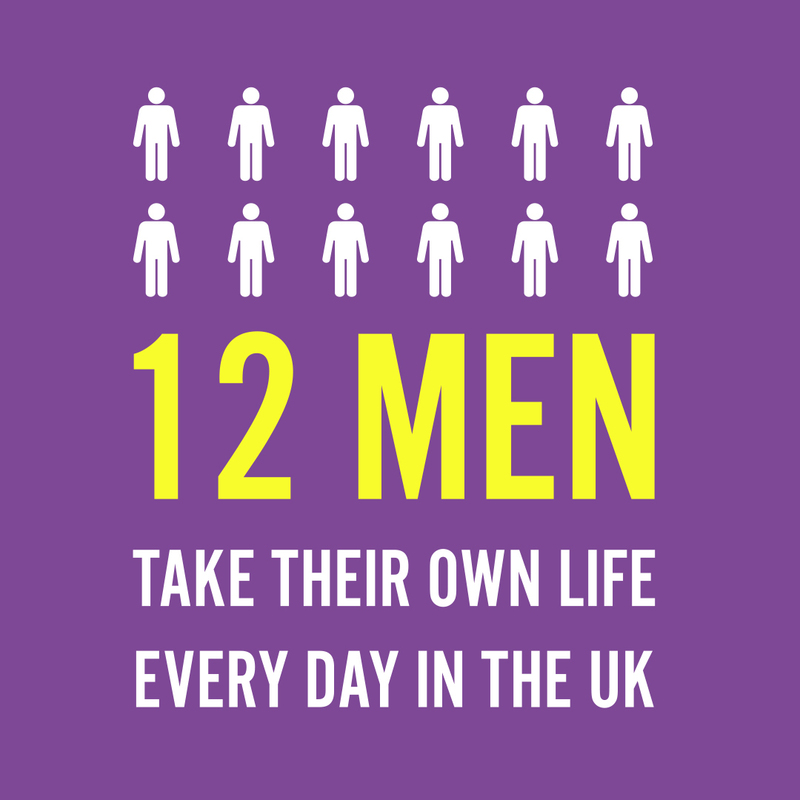 Great blog, very useful detailed information. Well done and thanks! I’m looking forward to visiting Nicaragua next June but I also wanted to combine Playa del Carmen in Mexico and after bumping into this encouraging and inspiring bus story of urs I was hoping u could help me out if u happen to know any reliable bus companies to get from Managua (Nicaragua) to Playa del Carmen (Mexico)..